The author of this book is the well-known host of MSNBC's "Hardball." He made his name as a political pundit by publishing this book in 1996, although his 1999 book Hardball: How Politics is Played, Told by One Who Knows the Game provided his lasting catchphrase. Matthews does "know the game," since he was a Congressional aide to Tip O'Neill (D, MA) and a speechwriter for Jimmy Carter. He also ran unsuccessfully for Congress in 1974, and considered running for Senate in 2010. 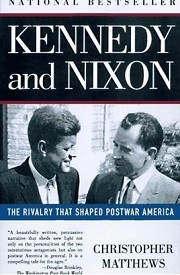 As indicated in the subtitle, the Kennedy-Nixon rivalry "shaped postwar America" from 1946 until Nixon's resignation in 1974. In 1946, both Kennedy and Nixon were first elected to Congress; both had served in WWII; they had offices directly across the hall from one another when Nixon was Vice President and Kennedy was a Senator. Those parallels are explored along with their differences: Kennedy lived a wealthy lifestyle in Georgetown with servants; Nixon instead lived the "Dagwood Bumstead" lifestyle (p. 56); Kennedy went to Harvard; Nixon went to Whittier College. Although Kennedy famously looked full of "vigor" in comparison with Nixon in the 1960 debates, in fact Kennedy was sickly compared to Nixon: JFK was given last rites once during back surgery (p. 99) and another time for Addison's disease (pp. 54-7). But the book explores more than their personal parallels and differences; it also explores deeply both their politics and their policy stances. Both fought Communism while in Congress: Nixon more famously with the "Alger Hiss case"; but Kennedy was no liberal when it came to Communism. In fact, that's one of the most interesting subtexts of the book: Both men pushed moderate politics instead of the harsh labeling of today. Nixon pushed what he called "practical liberalism" (p. 34) and Kennedy called himself a "fighting conservative" (p. 40). Those self-imposed labels are opposite of their party affiliation, and indicate a willingness to work with the other party in a way which would never be dared by today's politicians. The book concludes, "Today, the Kennedy Center and the Watergate sit beside each other along the Potomac--like unmatched bookends." This book is not a "retrospective" of "insider politics" like we at OnTheIssues hate--it has some real history; some real sympathy for both sides of many hot issues; and some real depth in explaining two important leaders' motivations. Chris Matthews certainly deserved to earn his reputation with this book--if only other political pundits did the same! John F. Kennedy: 1960: Called Martin Luther King's wife when MLK was jailed. Richard Nixon: 1947: Joined HUAC to catch real Communists. Richard Nixon: 1960: Declined to commit to a black Cabinet member. John F. Kennedy: 1962: Negotiated no steel price rise & no pay raise. John F. Kennedy: Rage at those who ignore Soviet expansionism in Europe. John F. Kennedy: 1949: Stop onrushing tide of communism from engulfing Asia. John F. Kennedy: Committed "Cold Warrior," including aid to Franco's Spain. John F. Kennedy: 1957: Switch from Eurocentrism to focus on developing world. John F. Kennedy: No US troops to Taiwan to defend Quemoy and Matsu. Richard Nixon: Coined term "Domino Theory": defend against Asian Communism. Richard Nixon: 1960: Krushchev's grandchildren will live in freedom. Richard Nixon: Appeasement didn't work with Hitler & won't work with China. Richard Nixon: 1968: Open China so they accept international rules. Richard Nixon: If every nation can't be friend, let them not be enemies. Richard Nixon: 1971: Initiative came after years asking "Who lost China?". Ted Kennedy: 1971: Nixon's China initiative was a "magnificent gesture". Dwight Eisenhower: 1952: Who can clean up the mess in Washington? Ike can! John F. Kennedy: 1946: Missed filing deadline for running for Congress. Richard Nixon: "Practical liberalism" instead of government control. Richard Nixon: 1952 headline: "Secret Nixon Fund" led to resignation call. Harry S Truman: 1940s: Stop the Red advance by military aid to Europe. John F. Kennedy: Lone senator to take no position on McCarthy condemnation. Richard Nixon: 1948: Require Communists to register with government. John F. Kennedy: 1946: Power of big labor has to be tamed. Richard Nixon: 1946: Labor PACs are Communist; so no PAC support. Dwight Eisenhower: 1955: Preferred to dump Nixon as V.P. Dwight Eisenhower: Suffered heart attack prior to 1956 re-election campaign. Gerald Ford: 1972: Killed banking committee's investigation of Watergate. John F. Kennedy: 1960 slogan: Get the country moving again. John F. Kennedy: Founded "Muckers Club" to fight high school elitism. John F. Kennedy: 1947: Diagnosed with Addison's Disease and given Last Rites. John F. Kennedy: 1953: Targeted Nixon as presidential rival for 1960. John F. Kennedy: 1953: Married Jackie when she was 22-year-old college senior. John F. Kennedy: 1955: "Profiles in Courage" established political stature. John F. Kennedy: Ran for Vice Presidency at 1956 convention. John F. Kennedy: 1957: Won Pulitzer Prize for Profiles in Courage. John F. Kennedy: 1960: primaries dominated for first time over backrooms. John F. Kennedy: "Camelot" symbolizes longing for something beautiful & lost. Lyndon Johnson: 1960: Planned on nomination at a brokered convention. Richard Nixon: Radio debate listeners say Nixon won; TV viewers say JFK. Richard Nixon: By age 43, elected to House, Senate, and Vice-Presidency. Richard Nixon: At 17, offered scholarship to Harvard, but could not afford. Richard Nixon: Founded "The Orthogonians" to fight college elitism. Richard Nixon: Earned nickname "Tricky Dicky" in 1950 Senate race. Richard Nixon: 1950s: As VP, frontrunner for 1960 presidential nomination. Richard Nixon: 1955: Outflanked Ike to keep V.P. post instead of Cabinet. Richard Nixon: Ran for CA governor in 1962 instead of President in 1964. Richard Nixon: 1972: Bugged offices of Democratic Party in Watergate hotel. Richard Nixon: 1973: Existence of tapes was fatal blow to presidency. Richard Nixon: 1973 Saturday Night Massacre: Fired special prosecutor. Ted Kennedy: 1972: Party's presidential hope as "Last Brother". Ted Kennedy: 1972: Used Congress' subpoena power to investigate Watergate. Ted Kennedy: 1973: Impeach Nixon if he refuses to give White House tapes. Ted Kennedy: 1980: I want to be president to bring sense of restoration. Dwight Eisenhower: 1957: Sputnik ended "Peace and Prosperity" boosterism. Richard Nixon: 1968: Built campaign strategy around controlling television. Richard Nixon: 1971: Absolutely no one should hear White House tapes. Harry S Truman: 1949: No military response to Communist victory in China. Harry S Truman: Soviet Union is animated by a new fanatic faith. John F. Kennedy: Avoid mistake of WWII by stopping Soviet advance in Europe. John F. Kennedy: Pouring money into jungles of Indochina is self-destructive. John F. Kennedy: 1962: Supported anti-Diem coup as means to win Vietnam War. Richard Nixon: Operation Vulture: Nuke Vietnam if North overruns South. Richard Nixon: Supported 1960 CIA-backed invasion of Cuba. Richard Nixon: 1965: If we give up Vietnam, Pacific Ocean becomes a Red Sea. Ted Kennedy: 1969: Get out of Southeast Asia lock, stock, and barrel. John F. Kennedy: New Deal contributes to end of capitalism in America.